Day Five – no accidents! >Have to make this a quickie as the Man and I have a hot date! Today was fantastic, I totally relaxed and decided not to put the pressure on the Boy by asking all the time so we just asked him to sit or cajoled him onto the potty every 1.5 – 2 hours and almost every time he produced a wee instantly. We went on a long bike ride after his morning wee and then stopped at a lovely beer garden for lunch where the Man took the Boy into the toilets (with the potty as he is a bit scared of the big toilet at the moment, one step at a time!) and he did another wee. I was so proud (as usual). 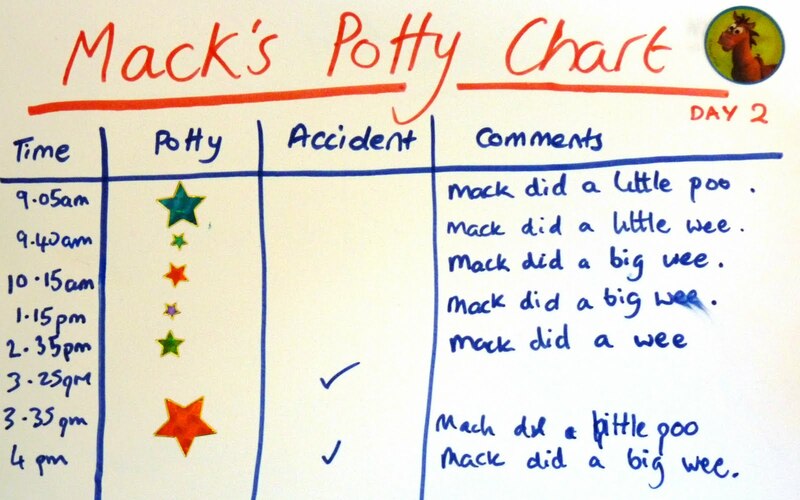 So here is his chart for the day (and he only asked for a chocolate reward once!). Thanks for reading! >Day Four started really well with me and the Man asking the Boy if he needed the potty and despite saying no (as always) he decided to sit on it and did a wee, all by himself!!! Cue two very excited parents. Unfortunately that was about it in self control for the rest of the day and from then on he was insistent that he didn’t need the potty despite proving himself wrong a few minutes later. For the rest of the day, judging by how much he drank and when he last did a wee we popped him on the potty and almost instantly on each occasion he produced. Its interesting because he can make himself wee or poo when we put him on the potty but he doesn’t ever say he needs to go. I don’t think we should be giving up yet as he is doing so well at actually using the potty but I don’t know how long until he’ll tell us he wants to go? If anyone has any experience of this I would be very interested. >Yesterday ended with the Boy in fear of the potty and not wanting to even get near it. As I have explained I only have a week off work to crack this, I think he is ready and have a terrible stubborn streak so for all those reasons I just don’t want to stop now. So, the morning was potty-loving time. First thing when we got up I gave him some fab 3D style Toy Story stickers and we decorated his potty with a few and I explained the rest could be stuck on when he had done a successful wee/poo on it. Well it didn’t work and all morning despite drinking milk and water he kept saying he didn’t want a wee, he was officially on production strike. At 1pm I caught him letting a little wee loose on the carpet so my fears were correct, he just didn’t like the potty anymore. So, what does a parent do when they can’t get their own way through pleading, begging or cajoling? Bribery of course! And he just so happened to have some of his easter egg left. 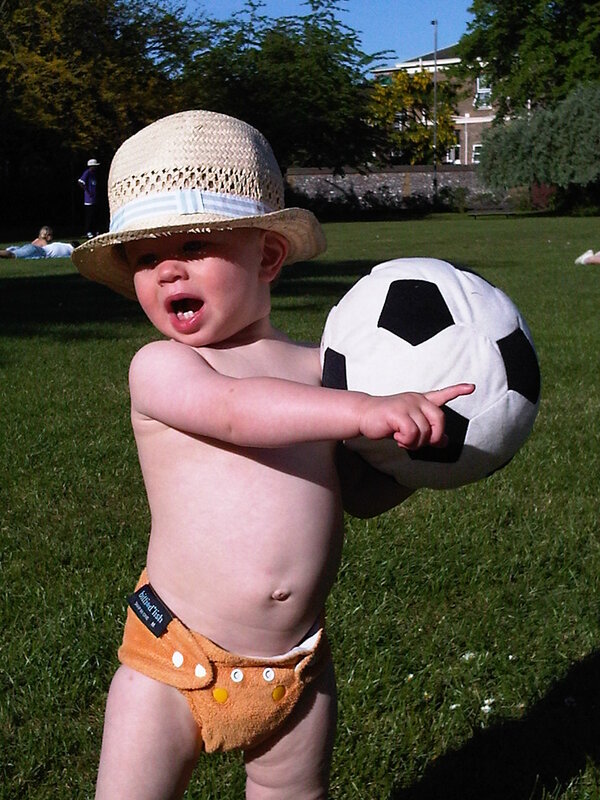 Cue a breakthrough with the potty and after lunch when he sat on it again we got our first successful wee of the day! Gina reckons that on Day Three you shouldn’t be sitting them on the potty but asking them if they need it. Thats all well and good for conforming toddlers but the Boy just keeps saying he doesn’t need to go, however the two times I sat him on the potty this afternoon he produced fairly quickly, so I am going to keep on this path until I see that he is a bit more aware. >This morning started with lots of promise, two accidents yesterday and I was confident we could crack on today with even more success. And that’s how it started out. I put him on the potty less but by lunchtime we’d had 3 successful visits and no accidents. 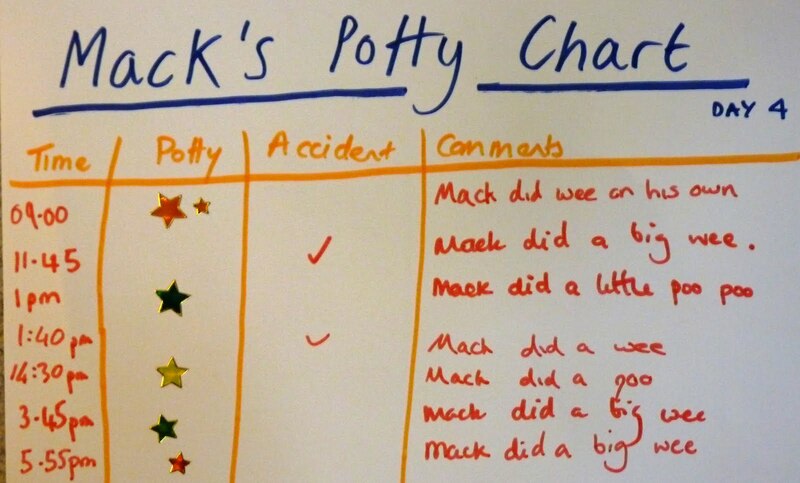 They were all when I sat him on the potty, not quite as impressive as Pixie (SuperAmazingMum’s little girl) who marched up our stairs and tried to sit on the toilet without telling anyone and did about 5 wees in the space of 3 hours, but I was proud. Then what happened, well I’m not quite sure as I had to do a conference call and left the Man in charge. I don’t want to be throwing any blame about but of course in my head I am wondering “what if” – two accidents in the space of an hour. 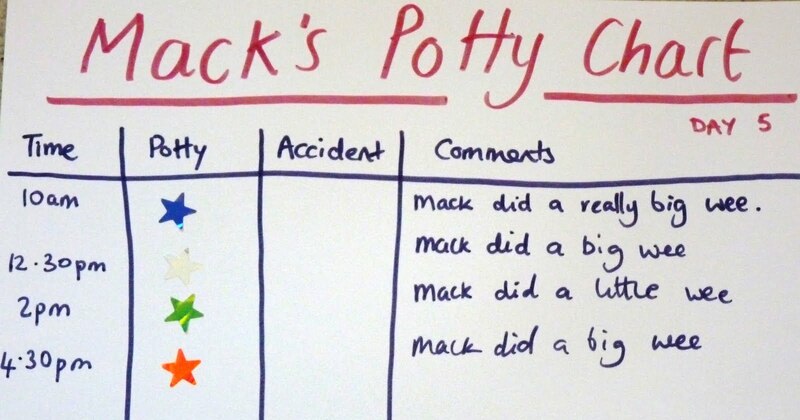 To make things even more challenging, since then he really doesn’t want to sit on the potty. He has been cajoled onto it with made up stories and some TV but nothing has been produced and he keeps saying “don’t like potty”. So I am at a bit of a loss, I heaped praise on him before bed for his marvellous day (because overall it was) and told him that tomorrow we would wear pants again, but I am a bit worried as to how to deal with this. 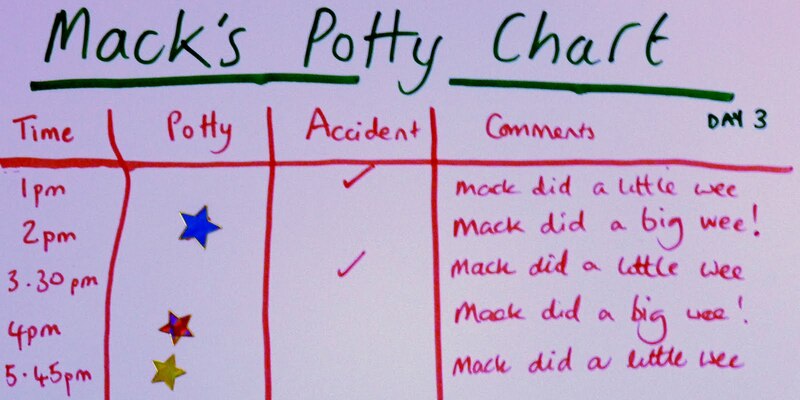 There is no going back but if anyone has any tips to conquer this potty fear, I would be very grateful. >Gina Ford instructions (simplified! )- sit them on the potty every 15 minutes for 5-10 minutes, if they regularly go then lengthen these gaps. The Boy woke bright and far too early this morning at 6.30am. Usually if I have a day off and the Boy wakes at such an ungodly hour, I feel 7 is far more sociable, then the Man will get him up and keep him occupied until he’s ready to go to work but in all the potty training excitement I rushed downstairs to ensure the Man didn’t put a nappy on him! So, first pant choice of the day – Toy Story. 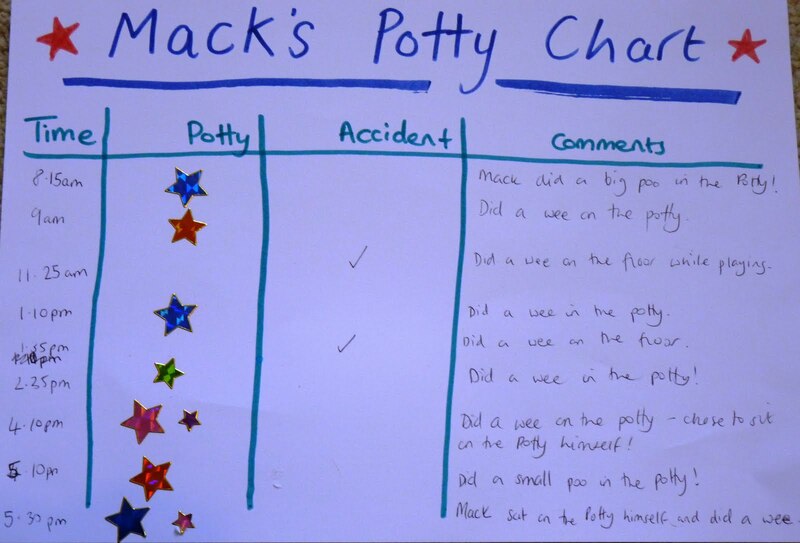 Here is our potty training chart, not a bad day I reckon. And to be fair to the Boy the two accidents were due to me not paying full attention to him at that moment in time. He spent a lot of the day sat on the potty drawing, reading, watching TV, singing, even dancing on the potty but the biggest achievement was his 4.10pm visit where he wasn’t sitting on the potty and he quickly went over to it – choosing to sit on the potty to do something is 2 stars, if I tell him to and he produces, that’s 1 star. >I would like to continue the words to the Crunchie advert here but I have completely gone off chocolate since finding out I am PREGNANT. Yay yay yay. 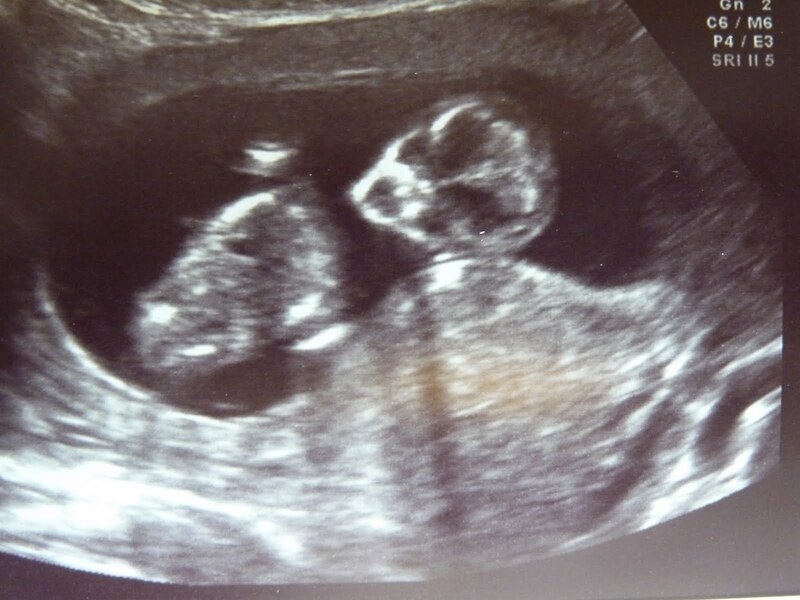 If you remember one of my first blog posts was about having a miscarriage on Christmas Day 2010 so you can imagine how over the moon I was this morning at our 12 week scan to see a beautiful, if slightly alien looking, baby with a really real live heartbeat. I am due on the 4th of November as I know when I conceived (I was charting, which is a whole other post) but the hospital keep dating me at the 2nd because of my period dates, which is quite funny as that is the day DS was due 3 years ago. The Man is already taking about “birthday party economies of scale”. My nuchal scan risk is 1 in 8092, not quite as low as the Boy’s (1 in 24,515) but I still wouldn’t bet on that horse! I already have quite a bump thanks to the Boy who all but ruined my stomach muscles but more than makes up for it in cuddles and kisses. The Boy is quite excited about Poppy, so named because it was the size of a poppy seed when I found out I was pregnant (the Boy was called Peanut), and tells us he wants a brother called Sister or a sister called Brother. I am not entirely sure he gets the concept as he told me the other day that he has a Poppy in his belly button. I assured him that his was merely from eating so much ice cream! 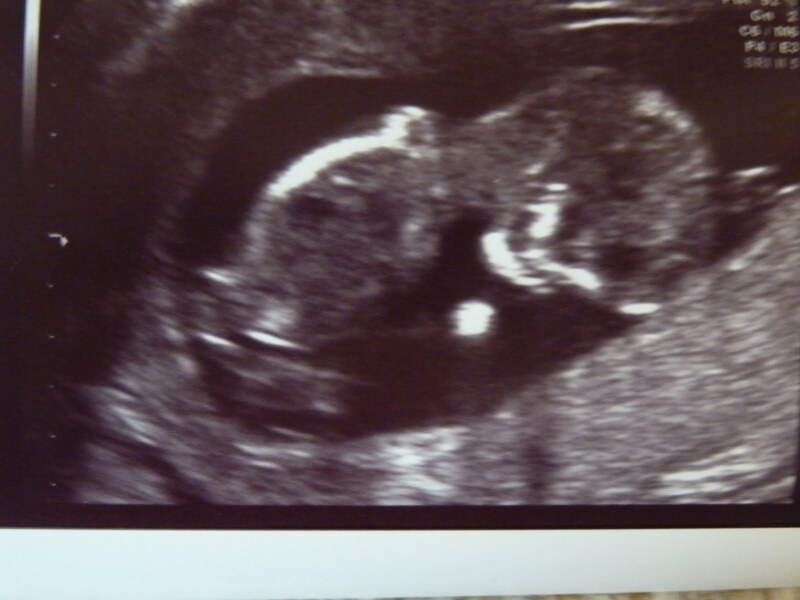 So now my blog becomes a parenting and a pregnancy one. I am very excited to be able to use this medium to keep updated on my pregnancy. Coming up next, Bump Watch! So what do you love about the Summer?